Working in a professional setting oftentimes means wearing business casual outfits every workday. There are the occasional “dress down” days that allow you to wear your comfortable clothing, but most of the time you are wearing uncomfortable trousers, jackets, shirts, and, of course, shoes. One of the best ways to avoid wearing painful dress shoes five days a week is to find a pair that are comfortable for you to wear. This is very rare when you look in shoe stores, but you can always find perfect dress orthotic shoes at Orthotic Shop. Let’s look at a few perks of wearing dress orthotic shoes for your workday. One of the biggest perks of dress orthotic shoes is you will have long lasting comfort throughout your entire day. Whether you are standing, walking or sitting, the designers make dress orthotic shoes in such a way to be comfortable for you. Regular dress shoes utilize designs that are only for looks, which can cause pinching for your feet or lack of support for your arches, with little to no cushioning. All orthotic shoes come with excellent support, and they will not pinch you, and this is true of dress orthotics as well. Because orthotic shoes are made to fit well, you are less likely to get blisters or corns from your shoes rubbing horribly on your skin. This is something we all know too well with dress shoes; they rub our feet awkwardly, causing significant pain due to blisters or corns. A great perk of dress orthotic shoes is they will help you avoid this, and can even help you save money in the long run. The more blisters and corns you get, the more likely you are to purchase remedies and help such as cushions and bandages. This can add up over time, making you realize just how much money you spend on treating blisters and corns from your regular dress shoes. 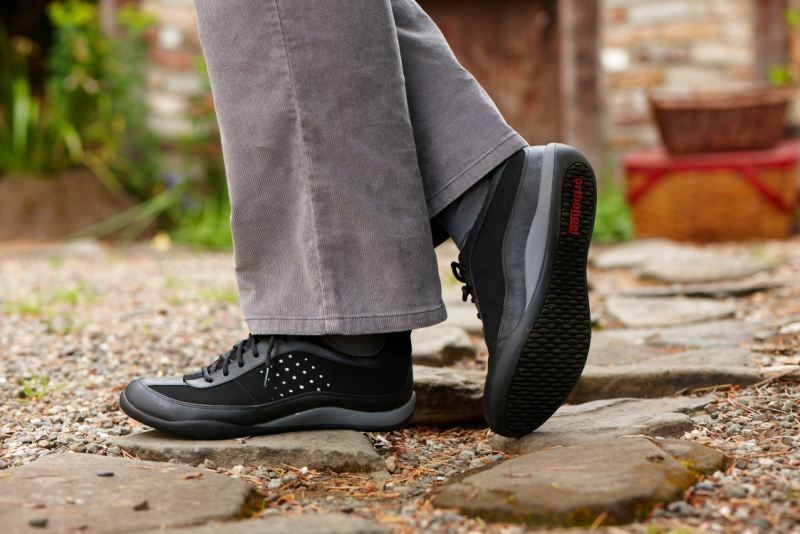 If you have to do a lot of walking for your job, such as being a social worker or walking around conventions, you might find that you are at a higher risk for foot injuries with regular shoes. By wearing dress orthotic shoes, you are safe from injuries such as rolling your ankle when walking and any other accidents. Foot injuries can dampen a workday, and you might find that you want to take time off but cannot. Hence, why dress orthotic shoes are a great idea. Another great perk of dress orthotics is they still look fashionable while giving you support and comfort. Many people think that orthotic shoes slook like tennis shoes, but there are many different designers out there who have made some great, fashionable dress shoes for people. They understand that looking great, and keeping your feet and body healthy are both important to many people. Wearing orthotics in general holds the benefits of making sure you no longer feel pain in not only your feet, but also your legs and back. By wearing dress orthotic shoes, you will notice that your typical daily pains will either be minimized or completely gone. This is because orthotic shoes provide you with needed comfort and support while also ensuring that your body stays properly aligned. Proper alignment is vital to your body’s health and at dealing with or getting rid of pain throughout your feet, legs, back, and even your neck. If you are in the market for some great dress orthotic shoes, then The Orthotic Shop is perfect for you! Take a look at our vast selection of dress orthotics and find a style that will work perfectly for any foot conditions you have, as well as your working environment. If you have any questions regarding our shoes, please do not hesitate to contact us! Orthaheel produced some great styles for Fall 2011! A nice line of European-inspired slippers, boots, mary janes, and walking shoes. 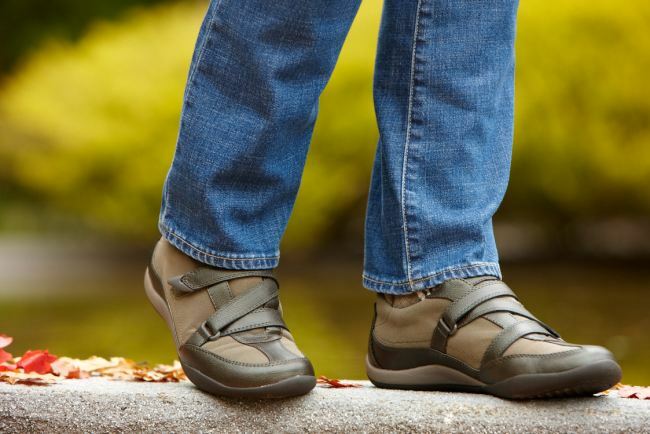 Each style features either removable or built-in orthotic arch support footbeds. You have the sandals, now get the shoes & slippers! Below are the new styles for Fall. Orthaheel Emma Boots with Orthotics – The Orthaheel Emma Lace up booties are a real treat for cold, tired feet, and stylish “to boot”! Fast Shipping and Free Returns at Orthotic Shop. Orthaheel Arcadia Mary Jane – Orthaheel Arcadia Mary Jane slip-ons delivers athletic-inspired comfort, orthotic arch support and sleek, sophisticated styling for year-round wear. 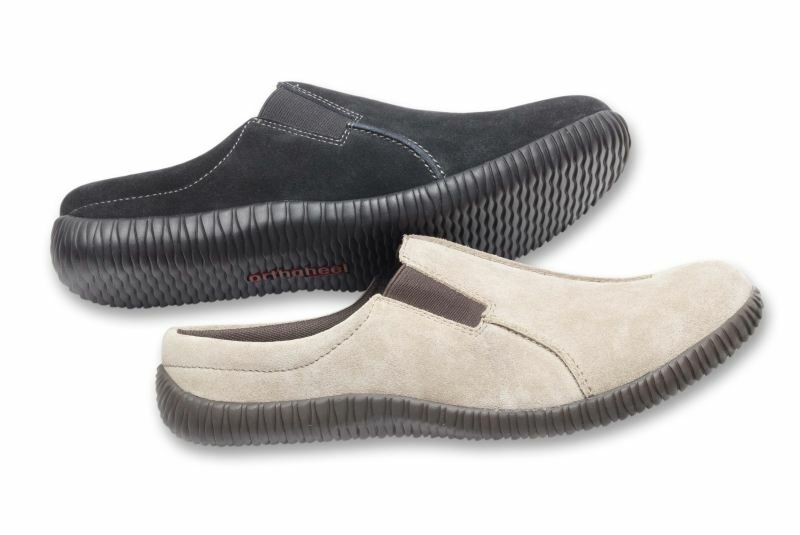 Orthaheel Bartlett Slip-on Walking Shoes – Orthaheel Bartlett is a sporty slip-on walking shoe with removable orthotics and hook and loop adjustable straps. Wearable comfort and clean, classic styling for year-round performance. Orthaheel Clayton Men’s Slip-on Shoes – Orthaheel Clayton is a mens slip-on casual shoe that includes a set of Orthaheels Active Orthotics. These casual slip-on mules are easy going, supportive, and perfect for lounging around or taking your dog for a stroll. Orthaheel Gemma Women’s Orthotic Slipper – Orthaheel Gemma is a comfortable orthotic mule-styled slipper. The Gemma combines the pronation control technology designed in Orthaheels sandals with a closed-toe soft terry cloth spa slipper! 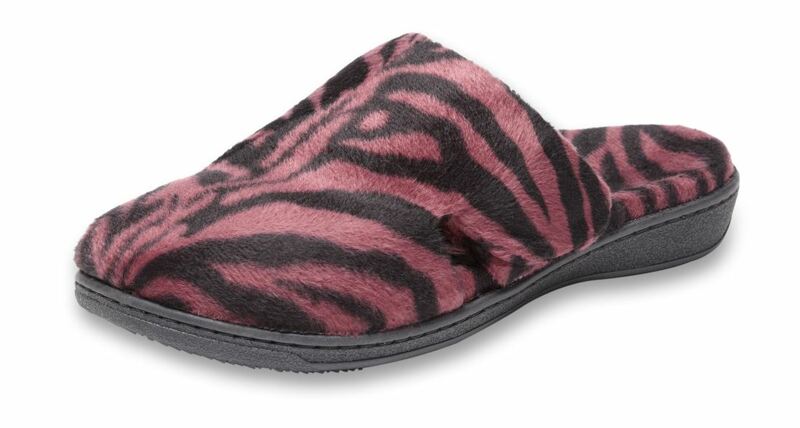 If you liked the Relax Slipper, you’ll like the Gemma! Orthaheel Melissa Mule – the Orthaheel Melissa is a Euro inspired mule that features a halter strap with buckle and gore closure that supports each step with stylish comfort. 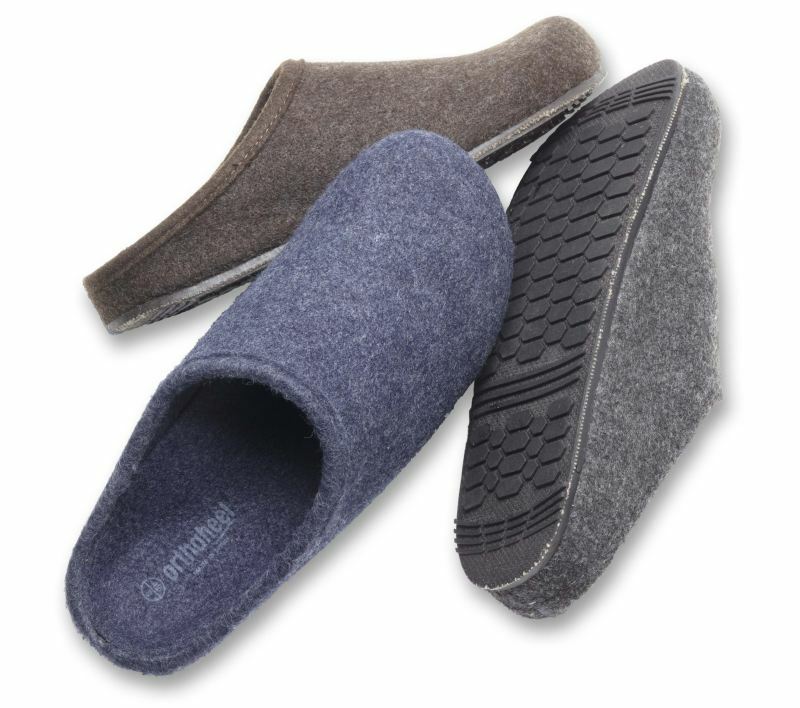 Orthaheel Navarre Men’s Slipper – the Orthaheel Navarre is a mule slipper for men that features orthotic arch support. These euro-styled mule slippers feature soft, breathable felted Italian wool uppers and footbeds to keep your feet at room-temperature. 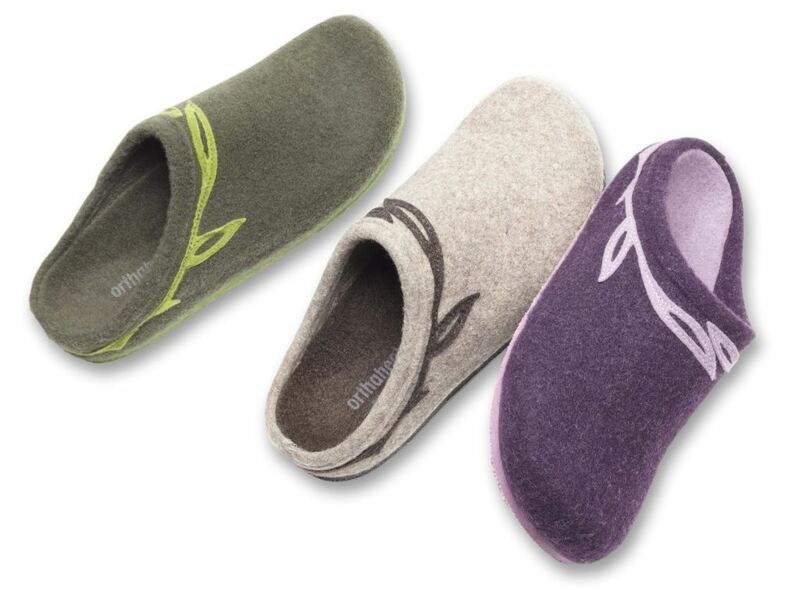 Orthaheel Relax Women’s Slippers – new colors are added in 2011 – Orthaheel Relax is a comfortable orthotic slipper. 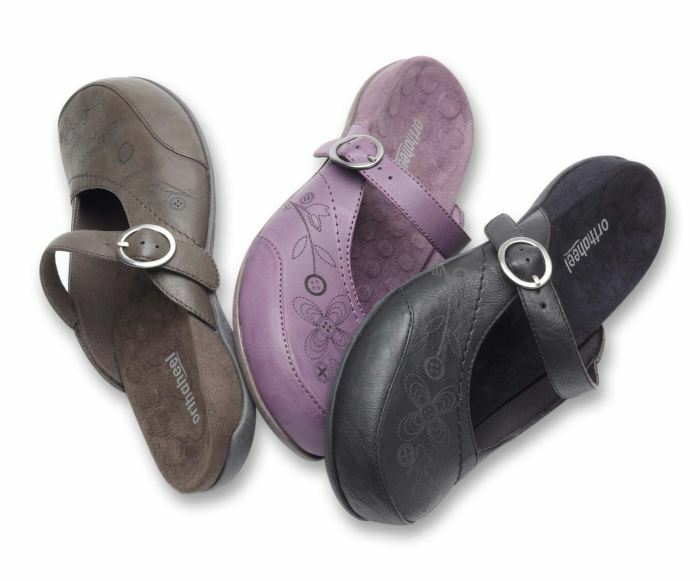 The Relax combines the pronation control technology designed in Orthaheels sandals with a soft terry cloth slipper! This slipper is great for men too, just get two sizes larger, for example a men’s 9.5, get a size 11. Orthaheel Venice Mule Slipper – the Orthaheel Venice Flower Orthotic Slipper is a feminine Euro-style mule slipper. 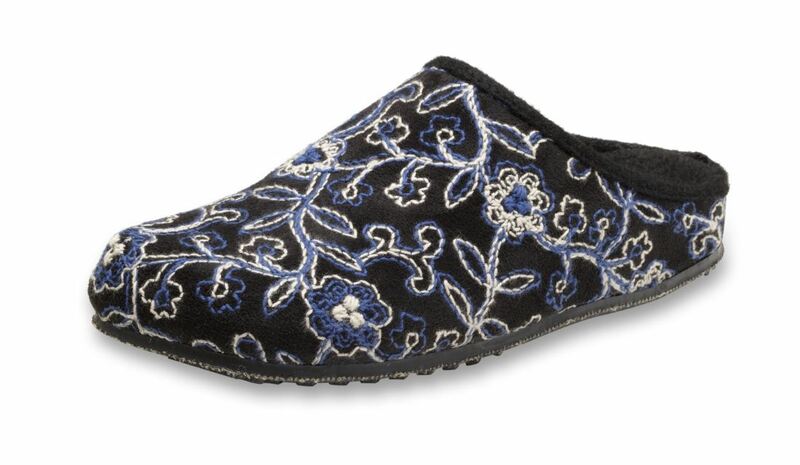 Features soft, Italian microseude uppers embroidered with a pretty floral design and soft, felted polyester linings. Available in two Colors. Orthaheel Verona Arch Support Slipper – the Orthaheel Verona Orthotic, Arch Support Slipper is a feminine Euro-style mule slipper. 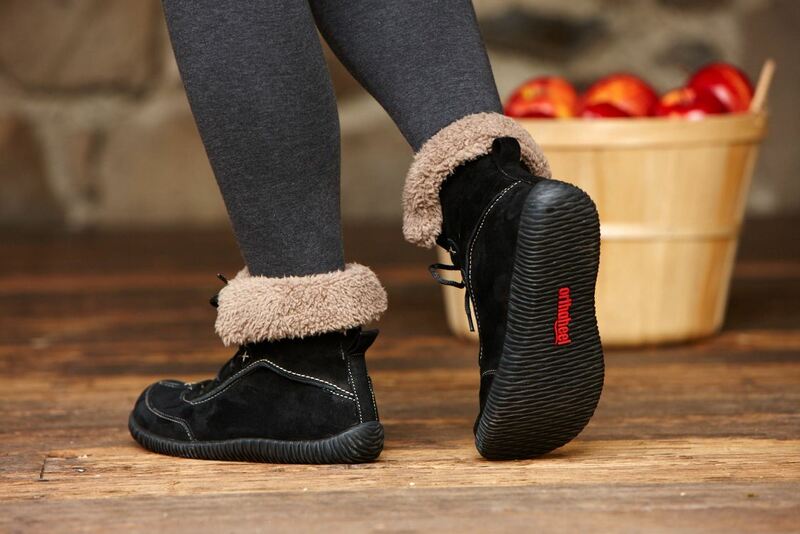 Features soft, breathable felted Italian wool uppers and footbeds to keep your feet cozy. The Orthotic Shop is dedicated to providing your body a solid foundation and we want you to get the relief fast! We warehouse all the Orthaheel footwear and ship them from a geographically-central location so you can be sure to get your comfort fast! Additionally, we offer free return shipping in the event you need to exchange an item or if you simply don’t like it. 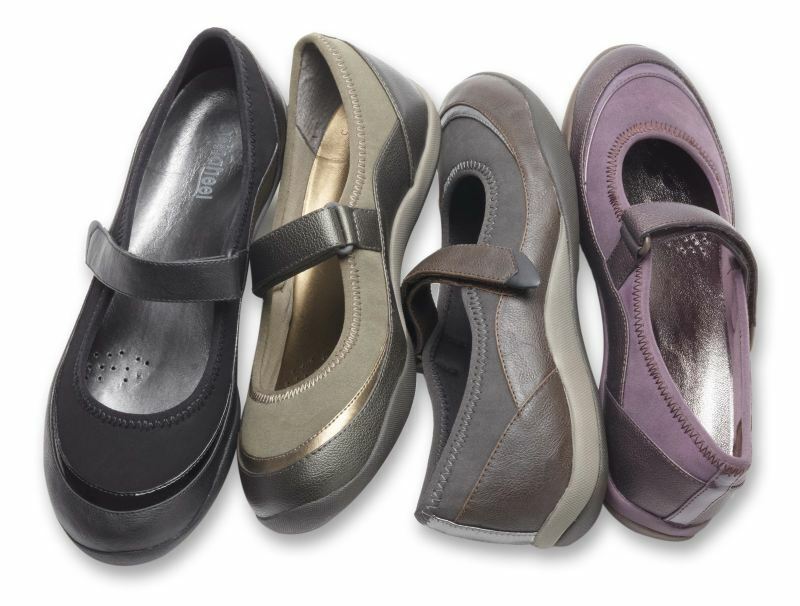 Click to see the entire Orthaheel Orthotic Footwear Collection at the Orthotic Shop. The Fall 2011 items will start shipping September 2011, we are taking limited pre-orders if you are reading this before September 2011!